Day Seven and the floodgates have begun to open for Team GB success. No less than seven more medals, three of them Gold, two of which came in the Velodrome in the Team Pursuit and the Womens’ Keirin. 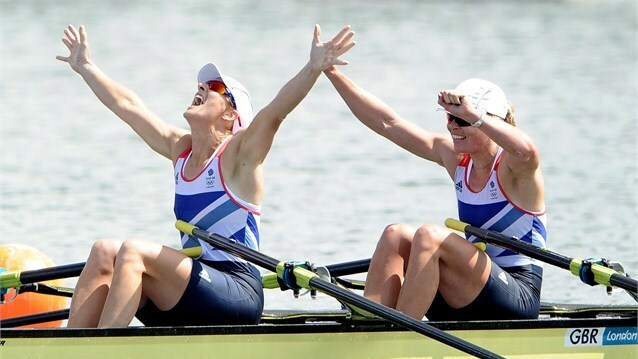 The other was probably the most popular so far – for Katherine Grainger, three times silver medallist in the womens’ double sculls, but now with her team-mate Anna Watson an owner of the top accolade. The other four were all Bronzes, two at Eton Dorney, another at the Judo, and the final one of the day in the pool for Rebecca Adlington in the 800m Freestyle, her second of the games. Day Four and another success for Team GB as the Eventing Team held on to their overnight position to take a well-deserved Silver Medal. I hope that their Royal team member can avoid some of the headlines, particularly the ones in the Daily Mail which suggest that she lost the team the Gold Medal through her making one crucial error. Technically, of course, the error was made by her horse, and it was hardly crucial when there were four other team members who also made small individual mistakes during the four days of the contest; that’s why it was called a ‘team event’. USA’s Michael Phelps en route yesterday to becoming the most successful Olympian ever, when he won his 15th Gold for swimming, his 19th Medal overall. One expects uninformed commentary from tabloids, particularly around sports that are not mainstream, but this has to be one of the dopiest in the long and undistinguished history of that particular rag. So how do you pass a dope test? Well first you need to sound like one – a good check there is to ensure that your brain is not fully-engaged before opening your mouth. Then you need to make sure that you’re talking to a reporter with an agenda. Most of all, you need to make sure that reporter is a member of the news arm of the BBC, and particularly one with a reputation to make within a two-week window of opportunity.